An alien beast evolved in an extremely dangerous Jurassic environment. They are the most evolved human creatures on that planet. On their evolution they adapted a thick skin pattern covering most of their body with incandescence properties that is both protective and communicative. The planet is so hostile they are willing to move to planets with advanced civilizations to earn their lives in exchange for heavy-duty work. They get trained to work with technological tools to build the biggest structure blocks. Sometimes they fall in love with a human woman and their conflicts and relationships create all kind of controversies. Nice backstory. Maybe you could push the concept a little bit more and it would be even more badass. Like maybe make the armor/enslaving metal parts more functional. Thank you!, I appreciate your advice and I agree with you. As I thought about it a bit more I now want to make the beast a worker on a the advanced planet so the suit, tools and base could be much more interesting and functional. This is the anatomy of the beast in ZBrush. Still needs more definition and I think I am going to add the horns as separate geometry. This is because I started to pull them easily on top of the head, no problem, but then the cranium shape was easily affected. I could use a mask but as separate peaces I could have more freedom to experiment. I am not sure if I am going to define to much the lower part of the body as it will be under the suit. Another thing I decided was to make the beast a more refined human man as I think it will ad more drama to his beloved human woman. This is the general proportion. Still more work to do like create some nails, rework on some muscles and work on the horns. Initial costume design. Created in Maya an imported to ZBrush. It needs a big tool with some wire connection to the suit, maybe a rotating tool. I want to work on the helmet to add more technology. In general there is a lot more detail to add and more design to do. The hair needs more work and separate fibers... Just a WiP update! I did not wanted to create or imagine a very extreme beast and keep the figure under "careful control and proportion". Everybody has the right to imagine a different story. But lets say for this concept I wanted to keep it "real" and 7' 6'' may be on the possible male size for a romance with an earthly woman. Also for them to have a real love story and not to look dispar she would have to be a tall and big beautiful woman. Here is an update with polycount just a hair over the 100K + 5K limit. To stay within the limit in the final render I will delete some of the small details on the left side. The next image shows the UVs. I will spend the last days painting the textures using Substance Painter 2.0 and maybe Mary 3.0. I included in my scene the pedestal, a machine, a tool and a piece of metal. The piece of metal is a cut the beast just made from a metal structure and it shows the precision of the cut and how hot the metal is. The beast uses the tool with his left hand. The machine, the tool and the metal are part of the beast and are included in the 100K polygons. Right now I am rigging the character to create the pose. It is a simple setup for the pose so I won't spend to much time here. Also I am finishing the normals in ZBrush and I did not included any in this update because I was retopologizing most of the geometry. These layouts include everything but the pedestal that is shown in the next image. So I am using all textures allowed for this contest. I haven't updated all my work in one application yet, but this image in Maya represents most of it. The rigging, a pose, illumination a most textures from Painter and the skin from Painter and Mari. 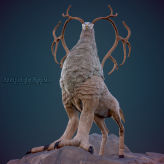 I am using Mari to compose all textures and to work on the skin, eyes and horns. I am also working the specular maps in Mari in 4K. In the image you can see the SSS Maya shader not working correctly and I scaled down to 1/10 the shader but still there is to much bleed, the figure looks to waxy and I don't like it. As I now have the time I will scale everything back to 1:1 and adjust all the shaders hoping a better result. Also I will add a skin image to all SSS channels properly adjusted and see what I can get from there. So obviously I will render the final image using Maya's Mental Ray. This is the process in Painter. I love it but I decided to export everything to Mari and work the final details there and then export everything to Maya. Who doesn't love ZBrush? I do. I will be adding details from Zbrush and sending this images to Painter and Mari up to the end. As you can see there is still more work to do on the pants, left hand and in other areas. Yes I am working backward and forward, but for this contest one goal I have is to learn all I can. So I did not had an efficient plan from the beginning, but so far my workflow is progressing and I think I can deliver a decent image for my final presentation. The skin base comes from Painter but I am working the details in Mari. If anyone have a comment, idea or suggestion to improve my work I am very open to hear from you! Thanks. Still there is a lot to improve on my work. Many things where rushed even with one more week to finish! This is one more image with some improvements and changes. Maybe I did not mentioned but I used all textures allowed up to 4K for the character and I used just procedurals for the pedestal. I used Mental Ray in Maya with SSS for the skin and global illumination mixed with 2 directional lights, and 2 area lights. I wish the best for everybody, it is amazing to participate in a contest like this one. Thank you Polycount and Allegorithmic! Details: The horn in the face now has the correct material. The plate on the right hand has the Belle logo. There is more definition in general. The plates on the front have a reflection map. Added the normal map to the rubbers on the back of the knees. The horns have a more uniform color. I fix some problems and more things appear. Veins are off, the texture on the left wrist is broken. And some normals are still inverted. I will try to fix these and also add the hair.